Research from the Irish Longitudinal Study on Ageing (TILDA) shows for the first time that the speed of heart rate change in response to standing up predicts mortality in older people. When we stand up our heart rate speeds up then settles. The rate at which this happens in older people has been shown for the first time to predict mortality four years later according to new research from TILDA published in Circulation Research, a leading journal of the American Heart Association. The team at Trinity College Dublin in collaboration with researchers from Harvard University's Center for Population and Development Studies found that the speed of heart rate recovery in the initial 20 seconds after a person stands predicts the likelihood of dying over four years in older people. The research team went a step further by dividing participants into groups based on their speed of heart rate recovery. Those in the slowest heart rate recovery group were 7 times more likely to die over the four year period compared with those in the fastest heart rate group. They remained 2.3 times more likely to die even when the researchers took account of other known risk factors for mortality and for heart rate such as age, diabetes, lung disease, socio-economic status, smoking, dietary factors, and body mass index. The research involved 4475 TILDA respondents aged 50 years and over who completed a detailed cardiovascular health assessment at the TILDA health centre at Trinity in 2011 and were followed up four years later. Participants in the study rested in a lying position for 10 minutes during which time their heart rate and blood pressure were monitored. Participants were then asked to rise from the lying position to a standing position [Figure 1]. This simple maneuver represents a major cardiovascular challenge causing the heart to beat faster as it tries to compensate for the drop in blood pressure that occurs when a person stands up after lying down. The heart beat then returns towards its baseline or normal rate and it is the speed of this recovery to baseline that is the key factor. The faster it returns to normal, the better. Commenting on the findings, the author of the report and Senior Research Fellow with TILDA, Dr Cathal McCrory, remarked that: "Our study shows that the speed of heart rate recovery in response to standing is an important marker of health and vitality that could be assessed quite readily in a clinical setting such as a hospital. It represents a new and potentially important biomarker of cardiovascular ageing that is useful for screening purposes." Also commenting on the findings, Principal Investigator of TILDA, and Director of the Falls and Syncope Unit at St James Hospital, Dublin, Professor Rose Anne Kenny commented: "Changing from lying or sitting to standing postures is a repeated activity throughout the day and poses a challenge to the cardiac system to maintain steady blood pressure and heart rate and thus lower stress on the system. We are excited by the potential to help people improve their heart rate recovery, possibly by simple strategies such as individualised exercise and to use these heart rate measures as a means of monitoring how well our interventions are working." Legend: Figure 1 shows the average heart rate and blood pressure response to standing among 4475 participants who completed the active stand in The Irish Longitudinal Study on Ageing (TILDA). The vertical axis represents values of heart rate in beats per minute (bpm) and values of systolic and diastolic blood pressure in millimeters of mercury (mmHg). 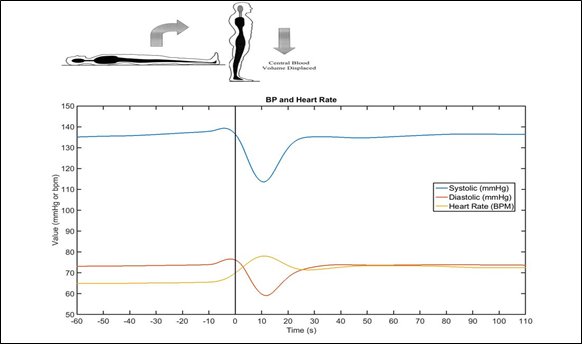 Resting values of heart rate and blood pressure were measured 60 seconds prior to standing. Heart rate rises rapidly in the initial 10 seconds after standing to combat the drop in blood pressure that occurs when a person stands from a lying position. The speed of heart rate recovery (i.e. decline in heart rate) between 10 and 20 seconds after standing predicts an individual's risk of mortality over a four-year period.